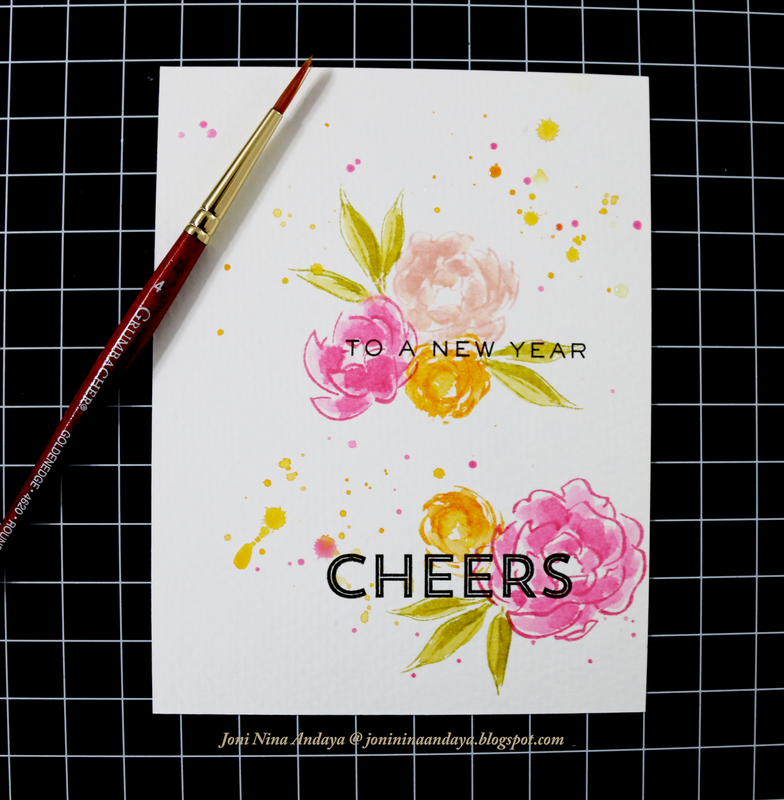 Hello there, it's Joni here sharing the new Twenty Fifteen stamp set and combining it with the famous previously released Pretty Peonies and Pretty Little Peonies stamp sets and Modern Numerals die. 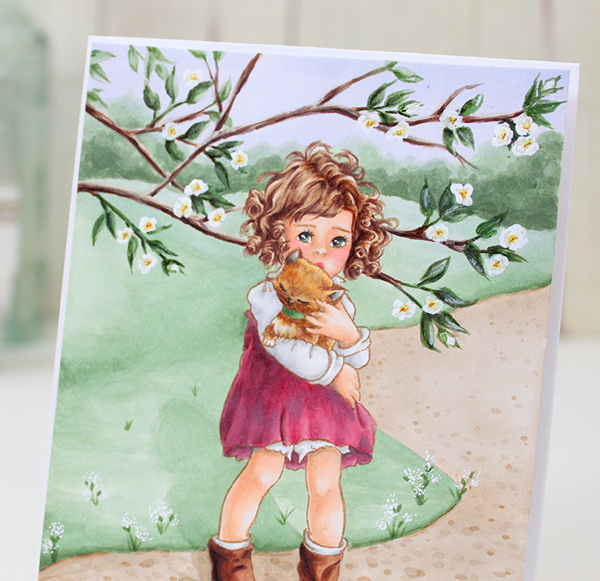 To begin my card I first stamped the images on watercolor paper and watercolored the image. I then added some splatters from the distress inks. I smooshed the pads onto an acrylic block, added some water and then used a paint brush to add the splatters. Next, I stamped the sentiment on the watercolor paper once the images had dried. 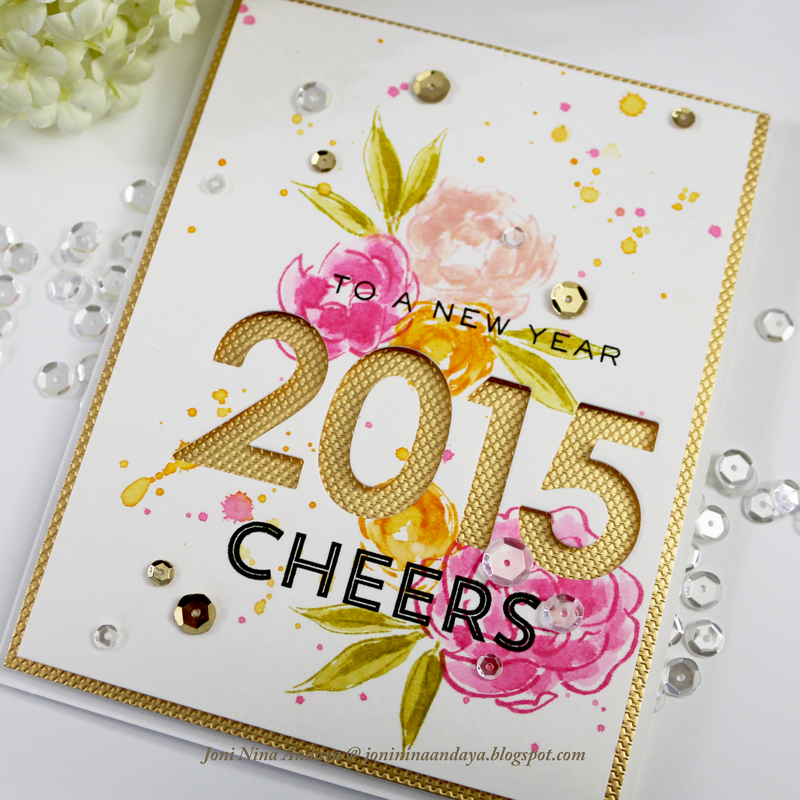 The sentiments "To A New Year" and "Cheers" are from the newly released Twenty Fifteen stamp set. Next, I die-cut the numbers from the Modern Numerals die from the finished watercolored panel and adhered it on top of a textured gold cardstock paper with foam tape (got it from a local crafts store). 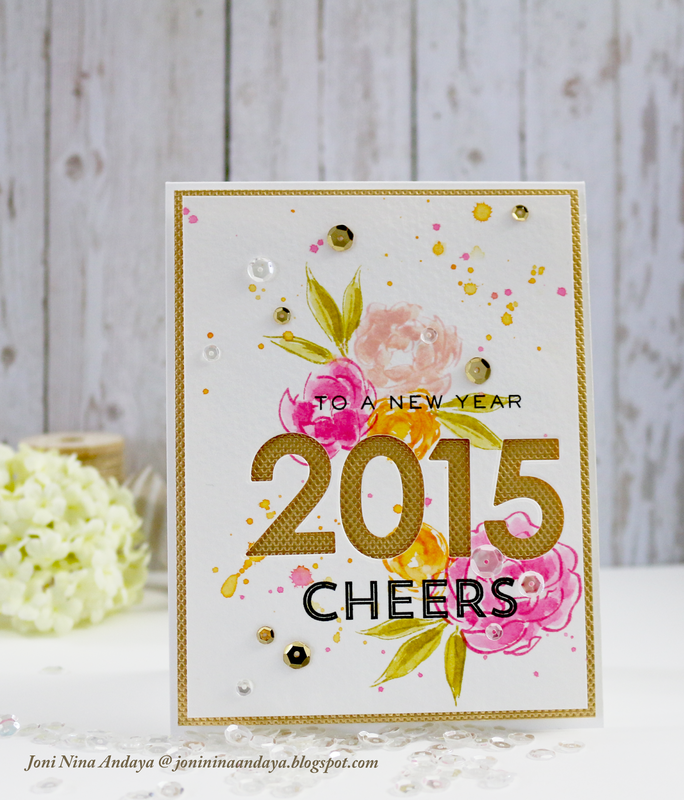 To finish off the card I added some sequins from Pretty Pink Posh in Gold and Sparkling Clear. And here's the finished look. I hope you guys enjoyed! HAPPY HAPPY NEW YEAR TO YOU ALL!!! Now that all the presents have been unwrapped there's just one more thing to do, say 'Thank You'. 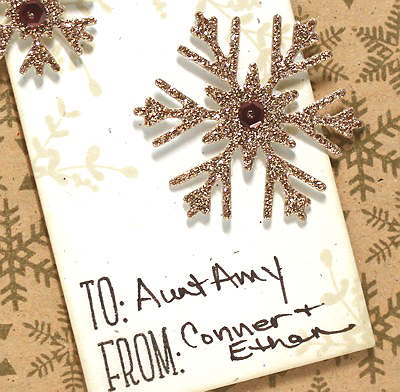 Kara here and I love to send Christmas 'Thank You' cards, especially to those I can't hug and thank in person like my nephews, my brother, and my aunt. I have certain criteria for these cards, though. They must be quick and easy to make, easy to mail, but still something special. 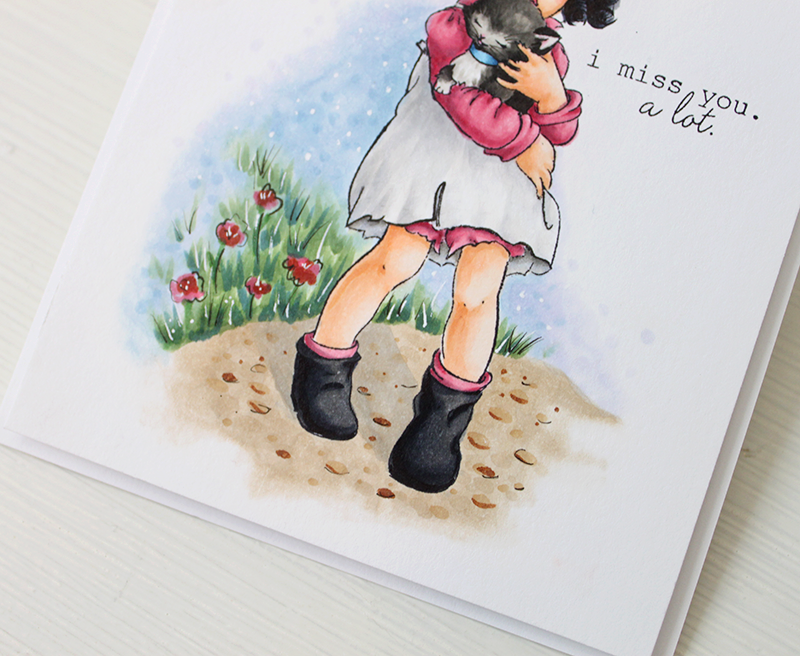 After making and mailing so many Christmas cards, extra postage and all, I want these to be just as special without the extra expense. Here are the steps I took to create them. I cut my 8 1/2 x 11 in. 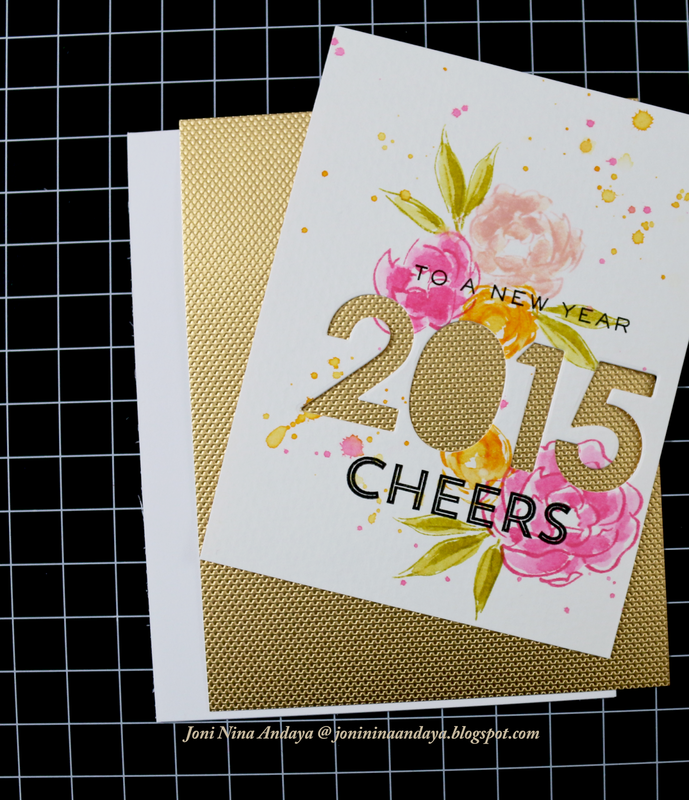 white cardstock in half lengthwise to create several top-folding cards. I scored each at 5 1/2 in., but did not fold them yet. I used the scored line as a guide for centering the Holiday Apertures Dies on the front of my card and ran them through my Cuttlebug with a tan embossing mat. I created a mask for the greenery from Merry & Bright so that I could get the placement of my candle in the correct spot. I could have skipped this step because in the end I covered the bottom of the candle with pine cones, but I didn't know that when I started ;) After stamping all of the candles I stamped the greenery in two shades of dye ink, Mojito and Appletini. I was then able to stamp my sentiment from Hand Lettered Thanks overlapping the greenery and within the embossed frame. 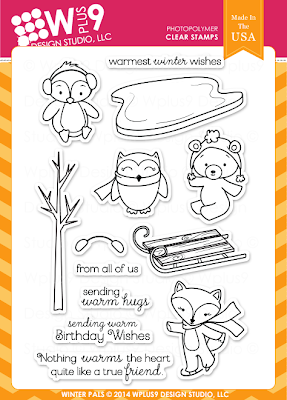 I then stamped the details like the flame and added the die cut pine cones. As a final touch I added a warm glow to the candles. Using the circle gem die from the Sparkle & Shine companion die set I created a mask and sponged on some Wild Mango Dye Ink. I hope you had a wonderful holiday with family and friends. Do you send out holiday 'Thank You' cards? Hello Everyone! 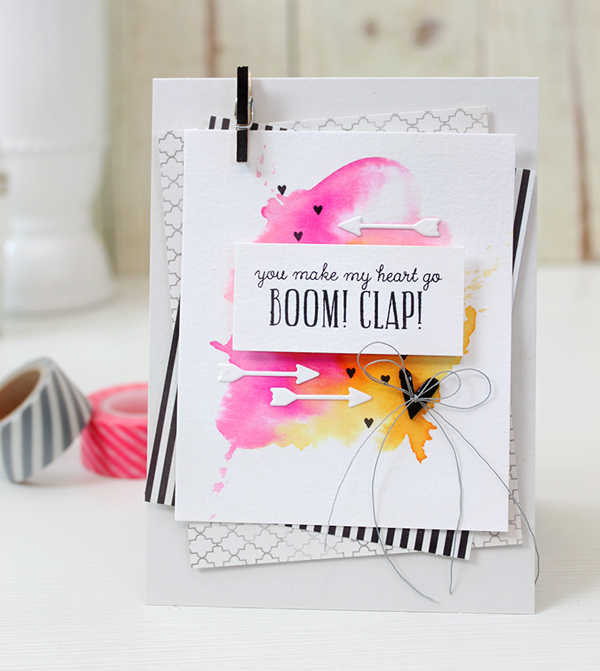 Joni here sharing projects using Wplus9's newly released Knock Knock Valentine stamp set with past released Clear Cut Stackers: Pear die. 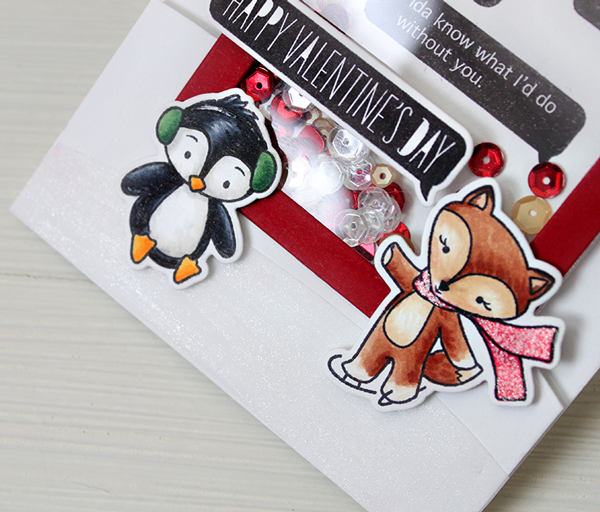 I made this card and tag for upcoming Valentines Day. I used a non-traditional theme to tone down the colors, perfect for the male recipient in our lives. 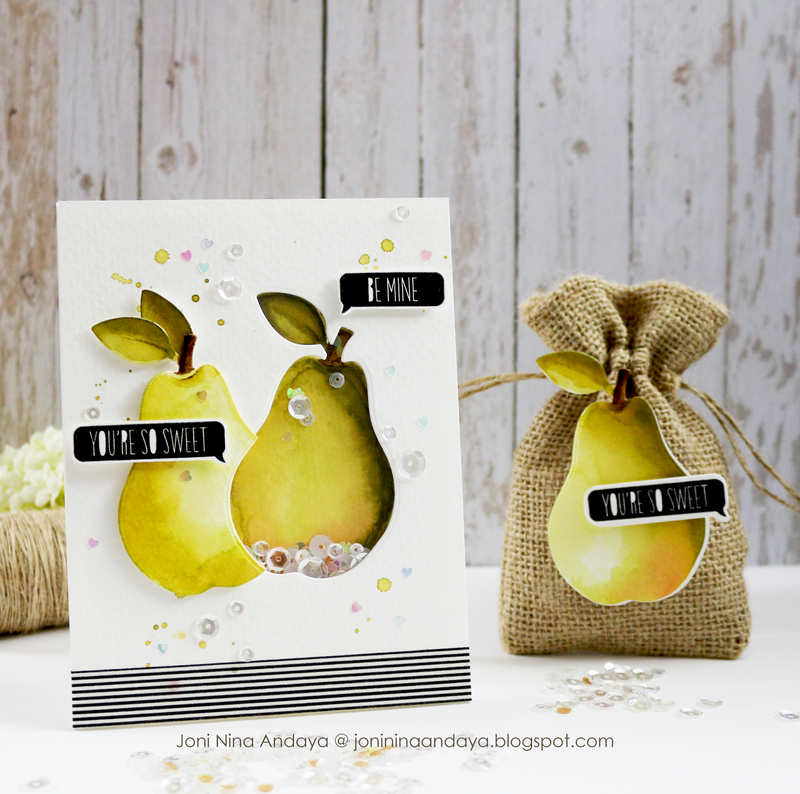 To begin my card, I first die-cut the larger pear from Clear Cut Stackers: Pear die from the card panel, then traced its shape with a pencil onto the card base before covering the top panel with clear cardstock to create a window for the shaker card. 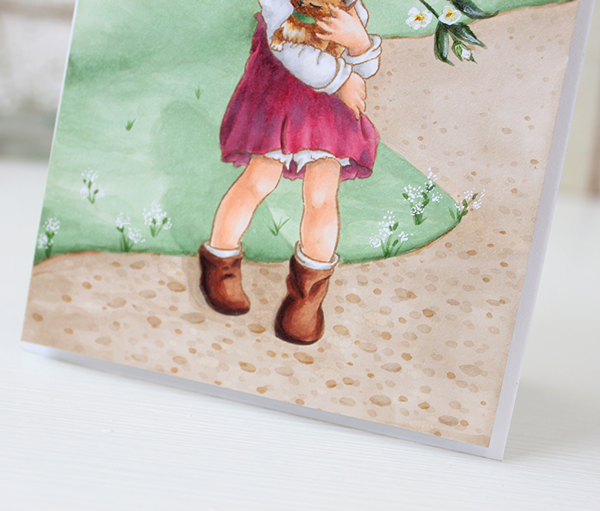 I also added some watercolor splatters to the card panel. 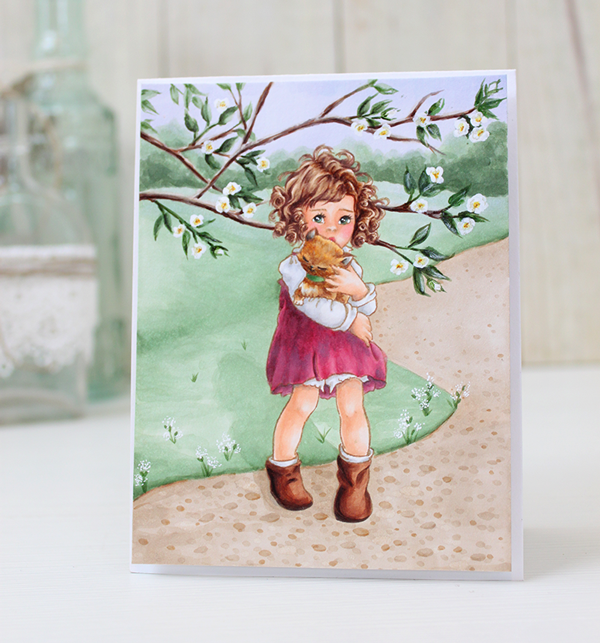 Next, with the traced pencil on the card base, I used this as a guide to watercolor inside the pencil mark to create the pear colored image. Then I added some foam tape, some marshmallow and sparkling clear sequins from Pretty Pink Posh to fill the shaker. 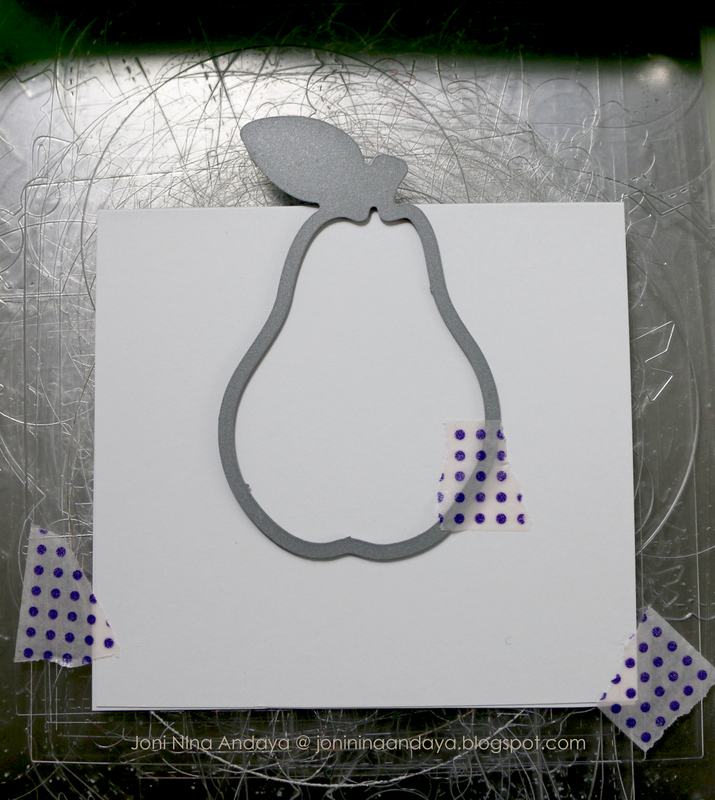 Next, I watercolored another pear that I die-cut and cut the piece at the bottom of the pear to puzzle the pear die-cut on the pear shaker. I then stamped the sentiment "Be Mine" and "You're So Sweet" from the Knock Knock Valentine stamp set, fussy cut, and adhered on top of the pear. I also added the striped washi tape at the bottom, and added some more sequins from Pretty Pink Posh to finish off the card. 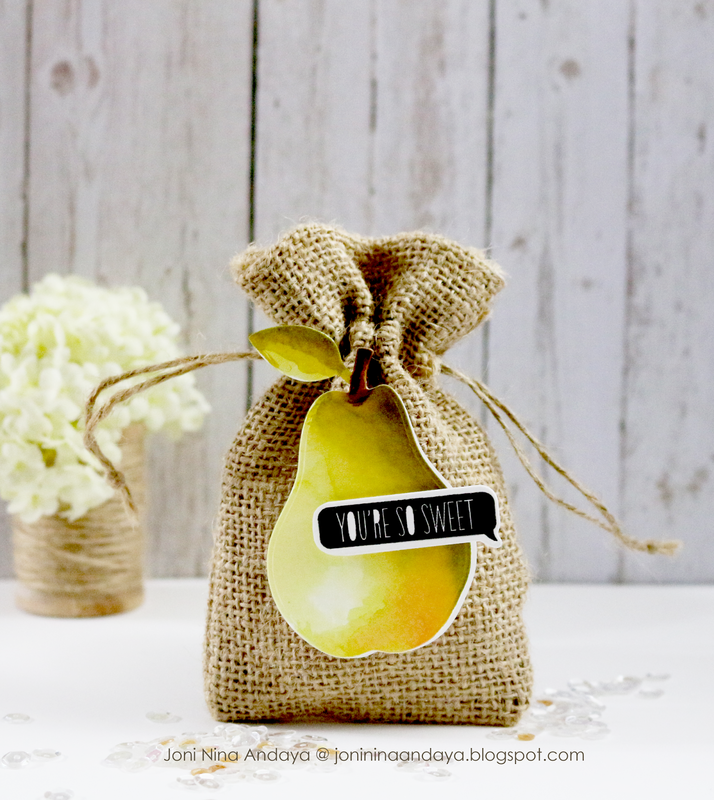 For my next project, I created a simple tag to go with me burlap goodie bag, using Clear Cut Stackers: Pear die. I first die-cut the pear and watercolored. 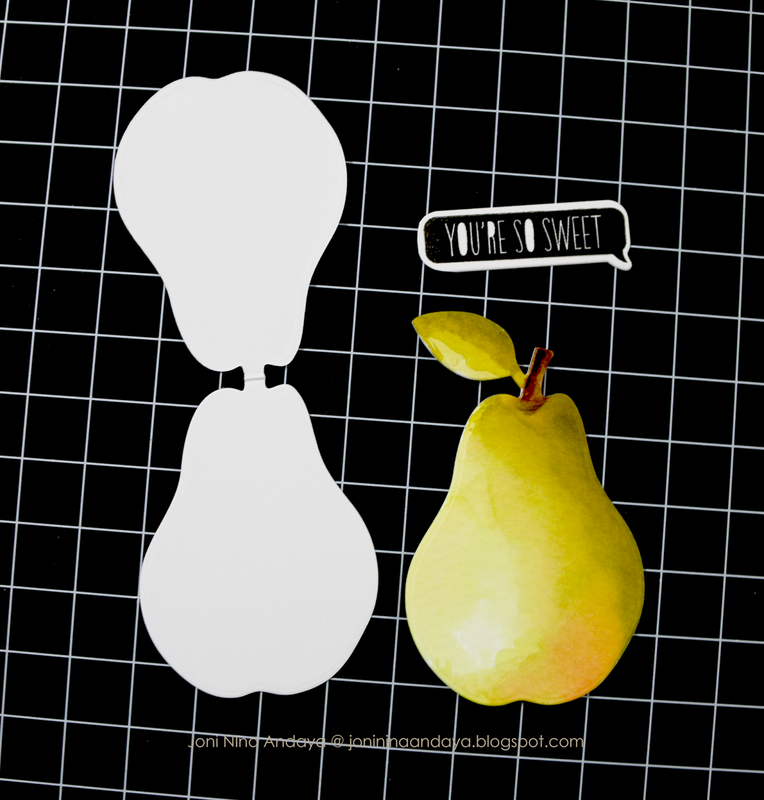 To create the pear tag, I folded a different cardstock and die-cut it, leaving the top of the pear uncut to have the fold on the tag intact. 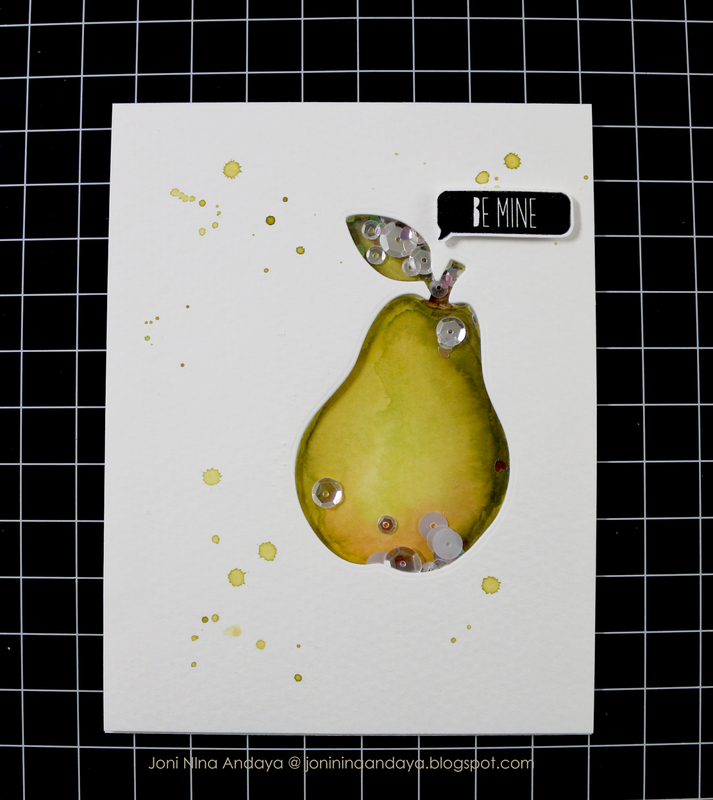 I then adhered the pear tag behind the watercolored pear to create the tag. 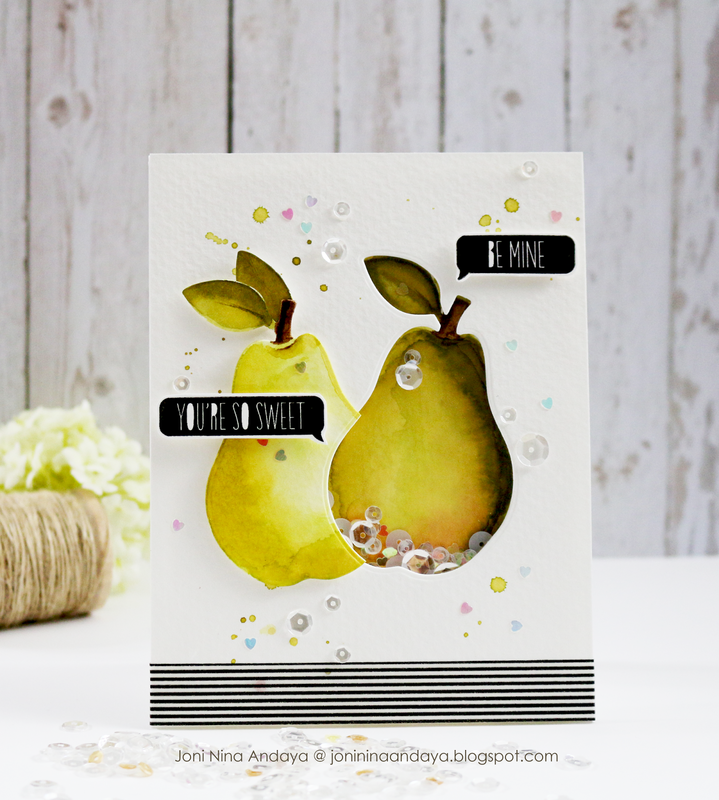 To finish off the pear card tag I added another "You're So Sweet" sentiment, fussy cut, and adhered on the pear with foam dots. I hope you guys enjoyed! Thank you so much for stopping by! 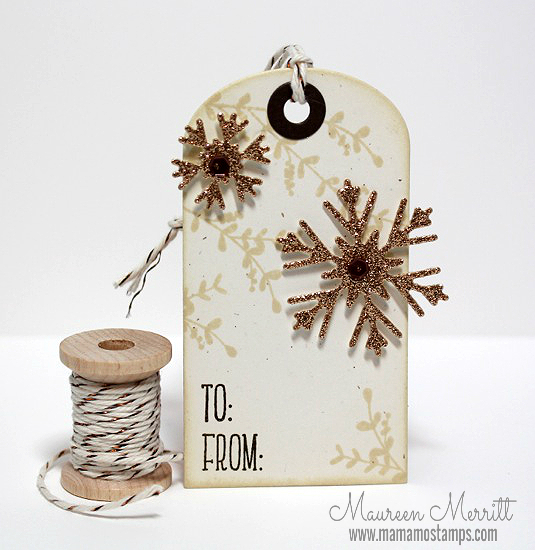 Hi, It's Maureen here today with quick and easy gift tags. I sat down to wrap gifts the other day and realized that I never purchased gift tags. What's a paper crafter to do? Make them of course! My paper this year is very rustic, similar to kraft paper with a gold snowflake print. I wanted the tags to coordinate perfectly with my gifts. These tags were so quick and easy to make. It took longer to die cut everything than it did to stamp and assemble them. When mass producing tags, or even cards, do one step at a time. This makes the process go much faster. 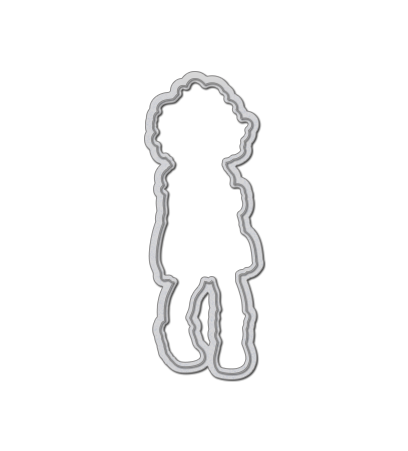 I started by die cutting all of my pieces. Since the tags and snowflakes are small, I could die cut both at the same time. Next I stamped the background, then distressed each tag. The sentiments were stamped one at a time beginning with the "From:" so I could ensure that I'd have enough room to fit it in. Thinking back now, I could have picked up both on an acrylic block and stamped them at the same time, saving myself one step. 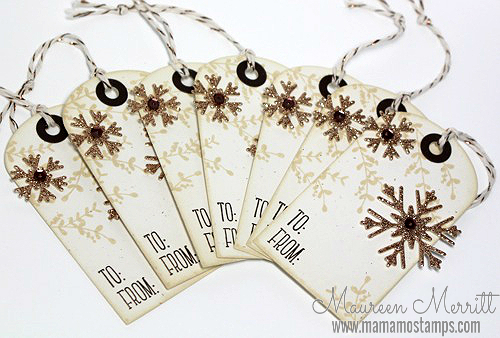 I added the snowflakes with dimensionals and embellished each tag with sequins. Forgetting to buy tags didn't turn out so badly after all. I'm thrilled that each gift we give this year will have that handmade touch, making it even more special. Happy Friday! I'm back as promised with more inspiration featuring our newest products. If you haven't yet, you can check out all of our new arrivals here. 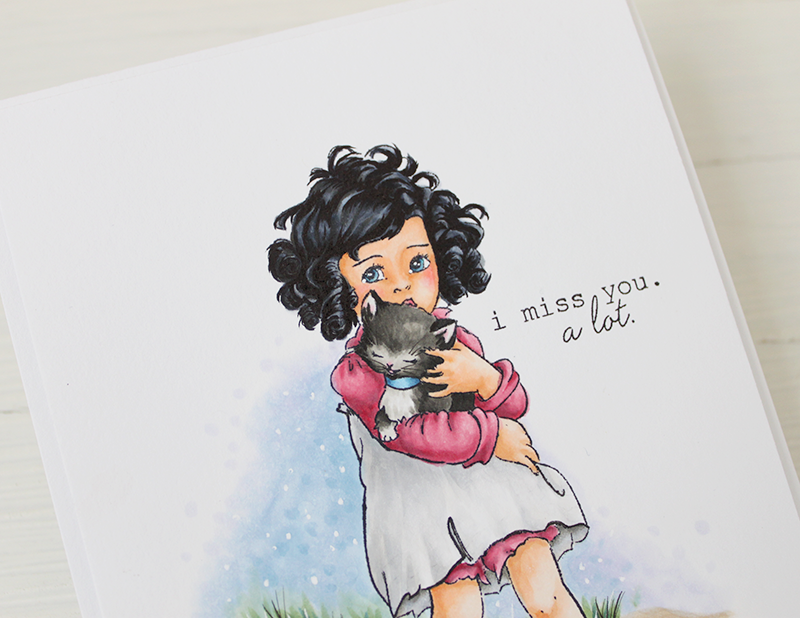 Today I have two cards featuring the Miss You Lots stamp set. This set is one of those that is a little more "dear" to me. Generally I illustrate all of my stamps digitally. This is one that I sketched first and is based on my little sister when she was a little girl. Let's meet Nicole. I am a huge fan of vintage artwork and illustration. I've tried to capture that essence in this image. The line weight is lighter and uneven to give it that softer feel. So naturally, I was dying to try it out stamped in Sepia ink and I really love the effect. For the background, I sketched in a few rough outlines of a scene and then went to town. The leaves and flowers on the tree were actually an after thought and added in very last. I used a paint brush and Copic Opaque White Pigment to "block out" some flowers and then, once dry come in and add details with Copic markers. I couldn't believe it worked. Since the colors in the background were pretty light and already green, the leaves weren't any problem at all to add in. For the rocky ground, I use a little trick that THE AMAZING Sandy Allnock featured in one of her videos. I just laid down my base color and then created pebbles by pushing the tip of my Copic marker onto the paper slightly laying it on it's side and varying the size and color. 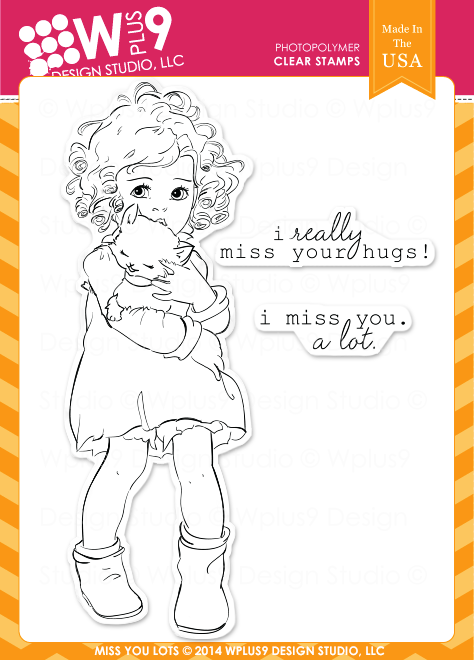 Since the front of this card was already pretty full, I decided to simply stamp the "i really miss your hugs!" sentiment on the inside of the card. This next card actually more closely resembles my sister with her dark hair, fair skin and blue eyes. No, I'm not envious...I have lovely dish water dirty dark blonde hair. This image is generously sized at 4 inches tall, so there is plenty of room to fit in some detail if you'd like. I didn't want to take the focus away from the girl in this one, so I kept it pretty basic with a simple background. I made sure to leave room for my sentiment, also from this set. I decided to go a little abstract with the background on this one, just adding the suggestion, and fading it out around the edges. I would say this was intentionally from the start...but truth is, I was kind of exhausted after the background in the first one. LOL I added some hand doodling with a White Gel Pen and a Black Copic Multi-liner. So what do you think? I hope you love this little image as much as I do...she sure is fun to color! Sandy Allnock - If you haven't already, you have to see Sandy in action. 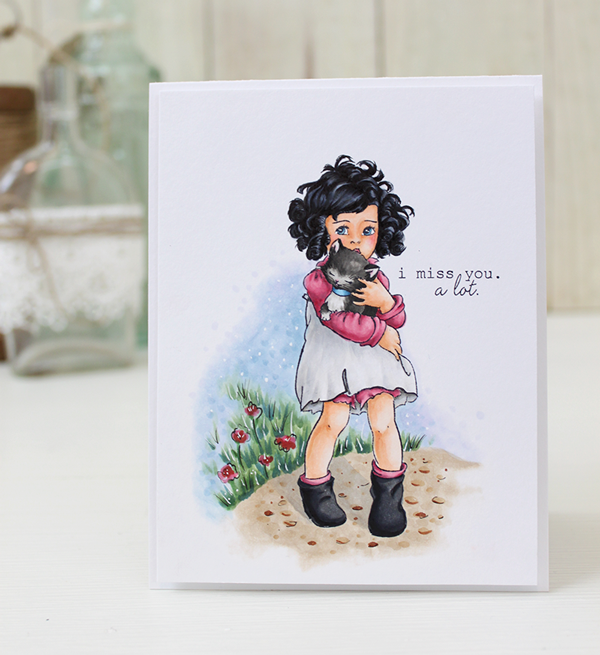 I am so excited to share a video tutorial she's done featuring Miss You Lots! Be sure to stop by Maureen Merritt's blog. She has more to share featuring our newest release. 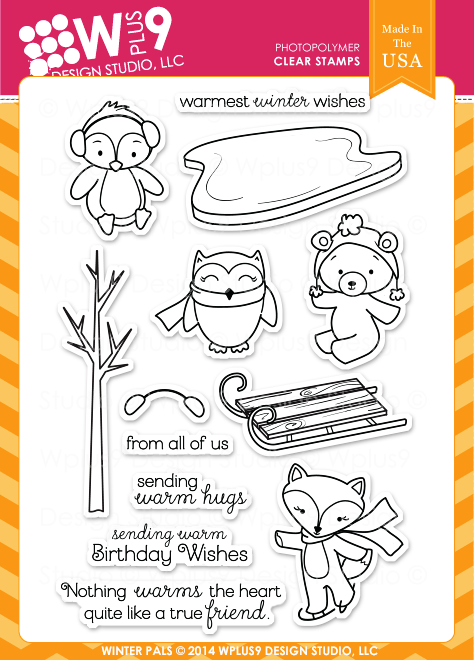 And Joni Andaya has a super cute and fun card to share today as well! Thanks so much for all of the wonderful comments and support you all have shown this week. You all are so kind and leave the most encouraging words. I can't express how grateful I am to be able to do what I love and to see what you all create! Thank you! See you soon. I hope you have a wonderful weekend! All of the new products we've been showcasing this week will be available for purchase at www.wplus9.com as well as at many of your favorite retailers. But before they officially go on sale, we still have lots more to share with you. 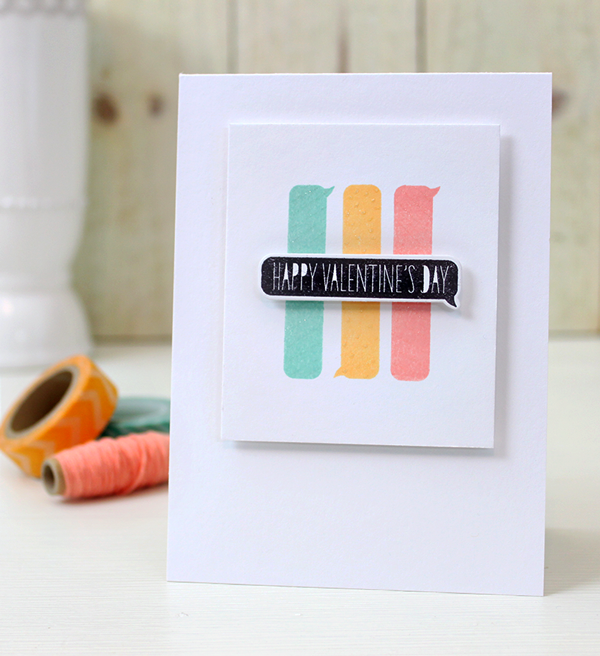 I have four cards to share with you today featuring the Knock Knock Valentine stamp set. 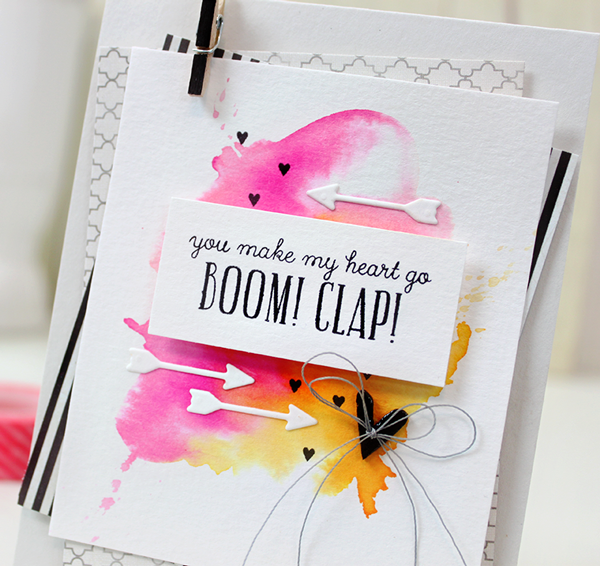 This set is filled with - you guessed it - punny knock-knock jokes! I created a fun shaker box using the previously released Clear Cut Stackers: Rounded Rectangles die and filled it with Pretty Pink Posh sequins. 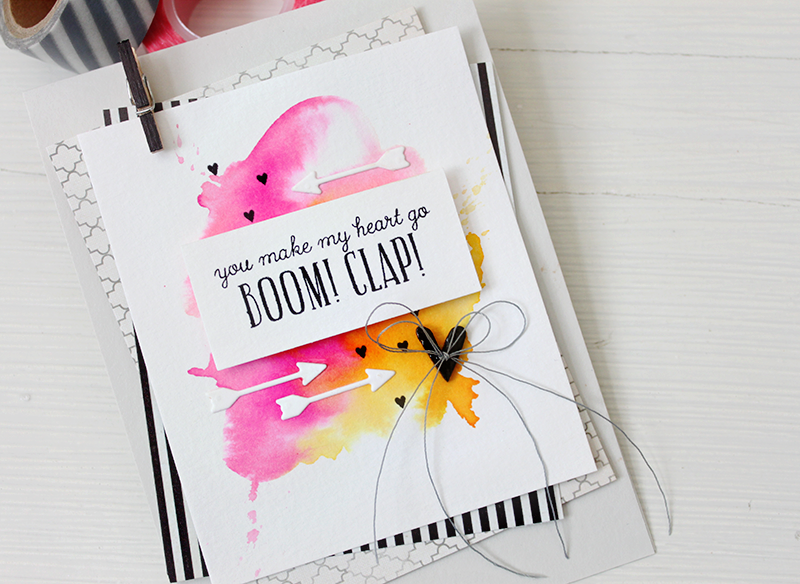 These little shaker boxes, sans card base, would make fun class valentines. Don't you think? 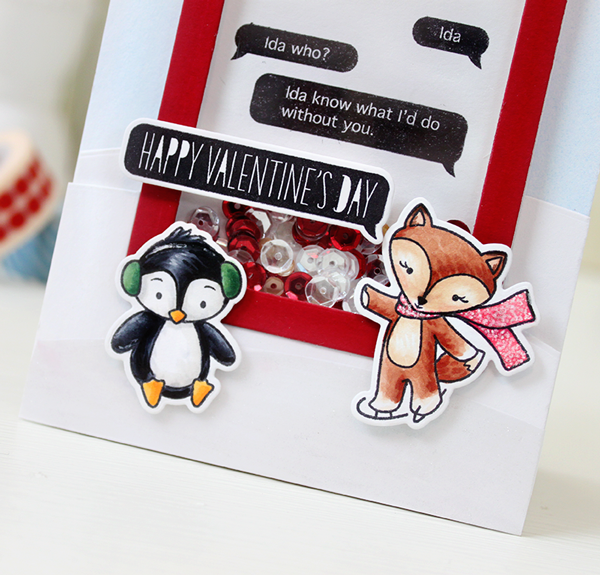 I added the penguin and fox from Winter Pals to opposite corners of the shaker. I think the playful styles compliment each other perfectly. 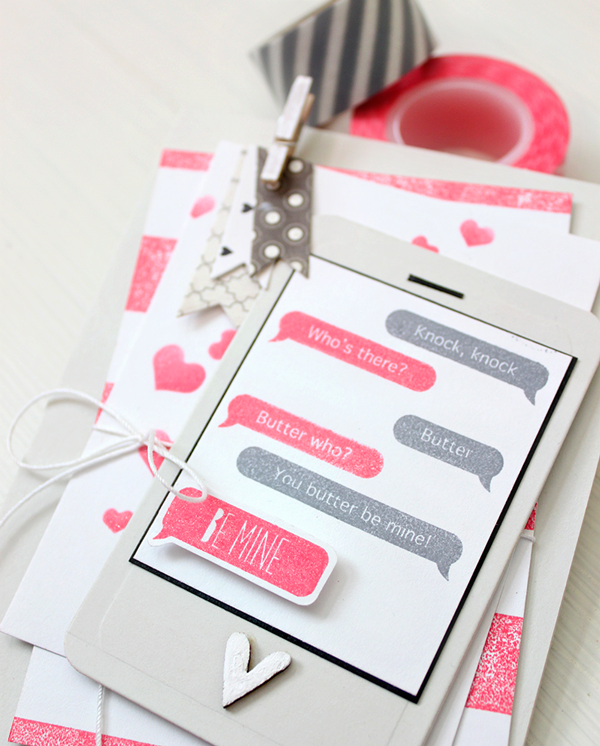 The "Happy Valentine's Day" speech bubble along with the solid speech bubble in this set, coordinates with the long speech bubble in the Conversation Bubbles Die. Bonus! To finish off the scene, I used our Landscape Borders Die cut twice from White cardstock and once from vellum to create some hills of snow and a little ice. 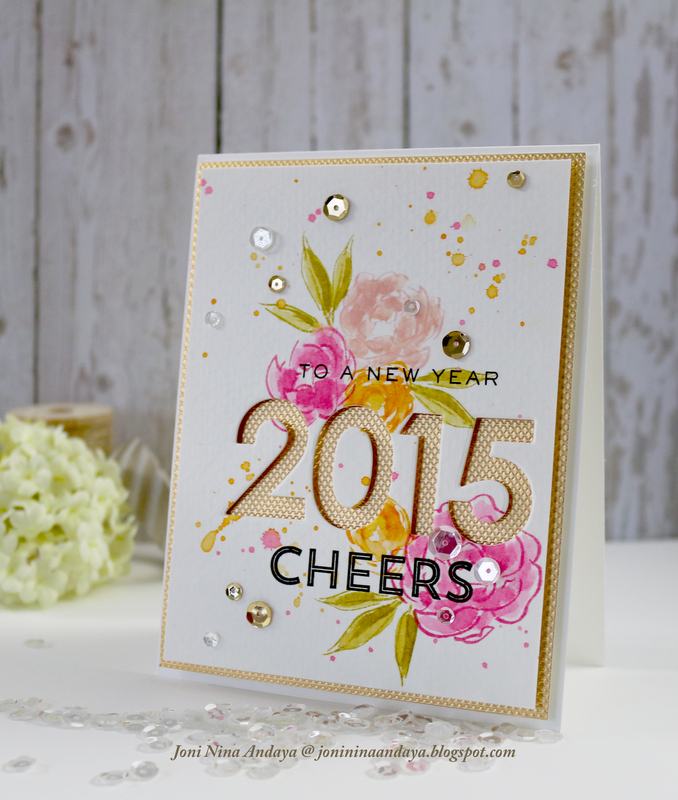 A little Wink Of Stella Glitter brushed over the vellum helps add to the suggestion of ice. Want to know a secret? This set was supposed to be released last December, but there was a mistake in one of the stamps. By the time it was noticed, it was too late to get it corrected and so I held them until this year....and then almost forgot all about them! LOL Thanks for the reminder Pat! 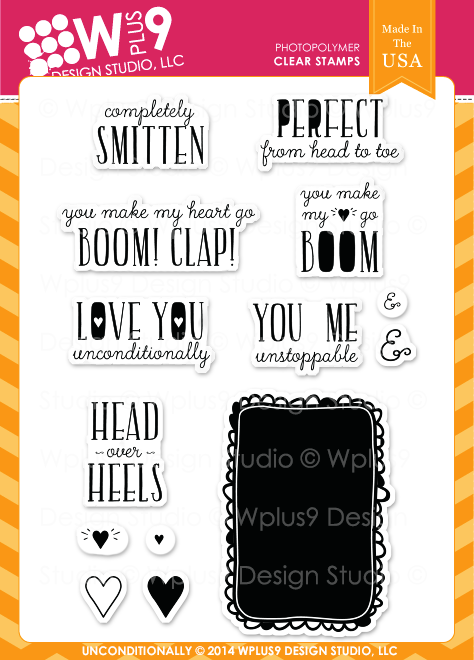 There are also a few separate speech bubble sentiments along with a solid blank speech bubble in this set that can be used alone like I've done in the next pair of cards. Two super clean and simple designs. 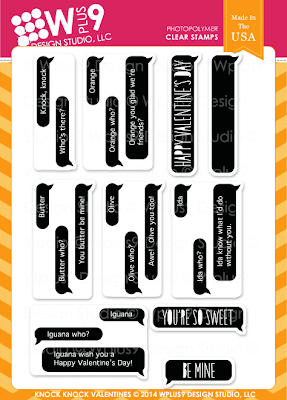 I started by stamping the solid speech bubble three times vertically in Ocean Drive, Wild Mango, and Sweet Nectar dye ink. SIDE NOTE: Why have I not used this color combo before? Love. 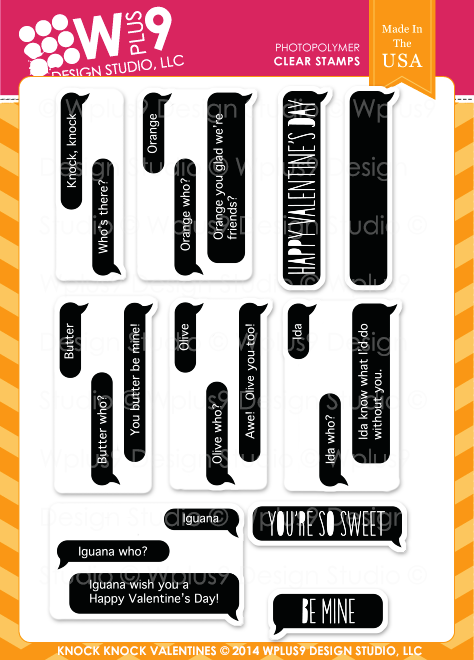 For the first one, I just stamped the "Be Mine" and "You're So Sweet" speech bubbles direction over top in Memories Black dye ink. I finished it by adhering the panel to the card base using a little foam tape. 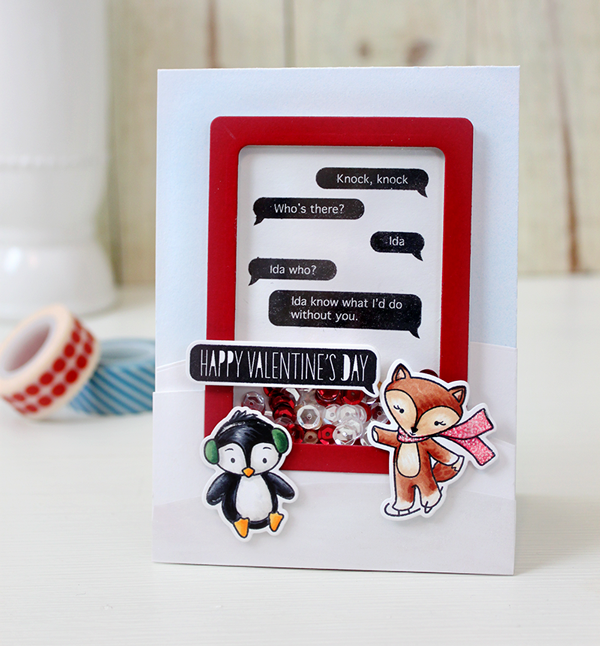 And for this one, I die cut the speech bubble using the Conversation Bubbles Die and stamped "Happy Valentine's Day" onto it. I added it to the center using foam tape and then added my panel to my card base, again using foam tape. I like to add a little foam tape for dimension when possible for super simple designs. Either of these designs would be perfect masculine "love" cards, nothing to fancy or girly. Again, I used the Clear Cut Stackers: Rounded Rectangles to create a smart phone. I used the larger rectangle for the base and then just cut a smaller rectangle from white for the screen. 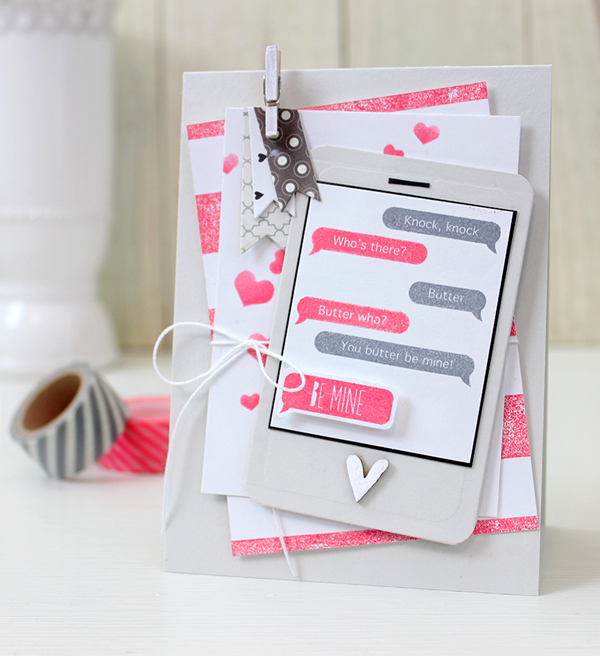 I stamped the "knock-knock" text message exchange alternating between Stampin' Up Regal Rose and Memento Gray Flannel. I hope you've enjoyed the projects shared today. The Design Team is also sharing more on their blogs as well, be sure to stop by and check them out! And here is a quick recap of all of the new products that will be available starting at midnight tonight. 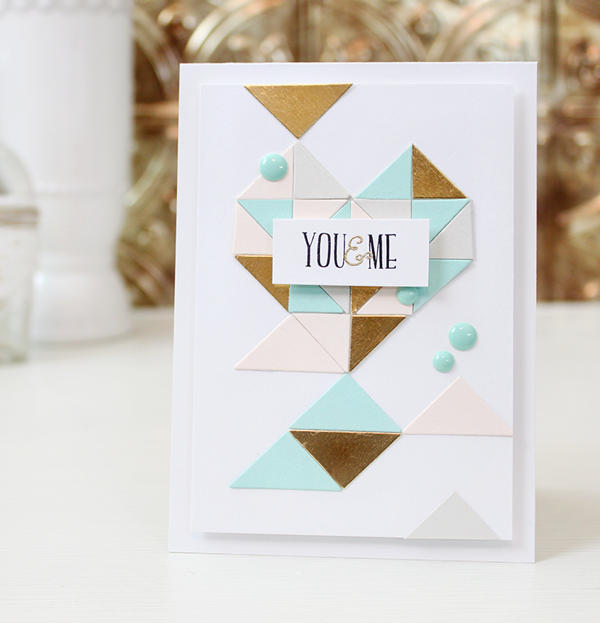 I hope you all have enjoyed seeing all of the new release products in action! Would you like to win the Entire December 2014 Release? Just leave a comment below by 10:00 p.m. EST on tonight, 12/04/14 to enter. I will select one random winner from all comments. 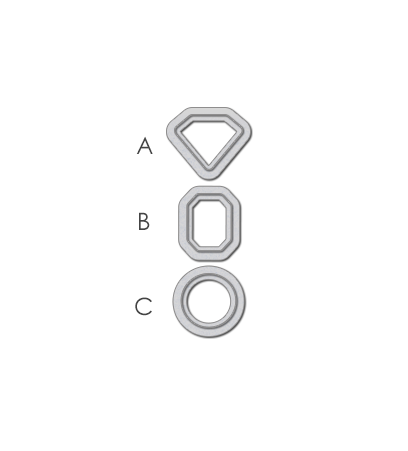 Winner will be posted on our Releaser Winners page by 11:00 p.m. and announced on our Facebook page as well. I still have more to show you and release week isn't officially over until tomorrow...so be sure to stop by again tomorrow for more inspiration featuring these new products! Good luck! It's Day 3 of of our December 2014 Release Week! 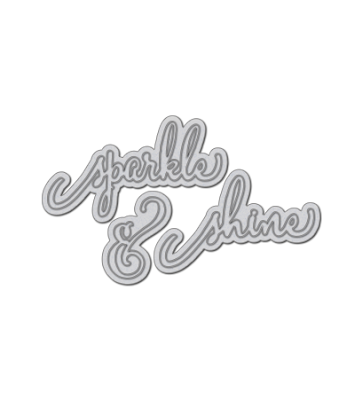 If you are just joining us, don't forget to check out Day 1 and Day 2 to see lots more inspiration featuring the new products we will be releasing on December 5, 2014. 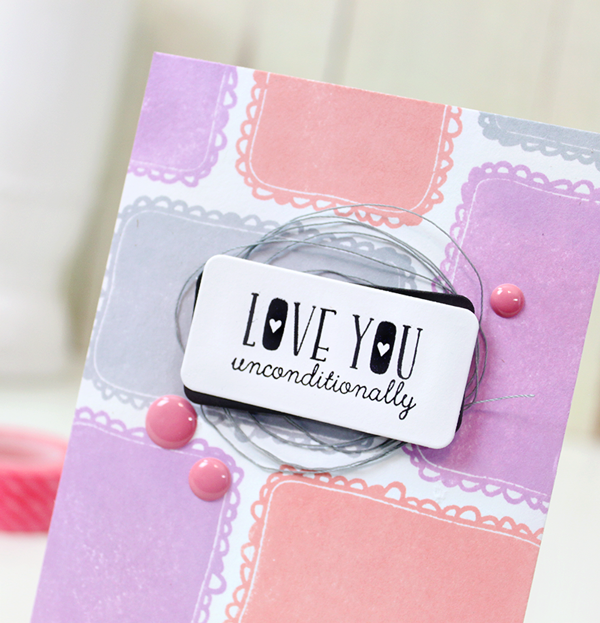 Today's cards all feature the Unconditionally stamp set. 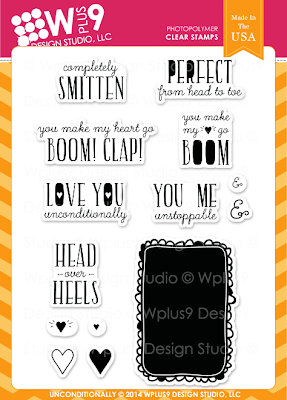 This set is full of a lot of great sentiments that are perfect for spreading a little love, whether friend-to-friend or with your significant other. And I gotta tell you, this is another one that I had a hard time putting down! 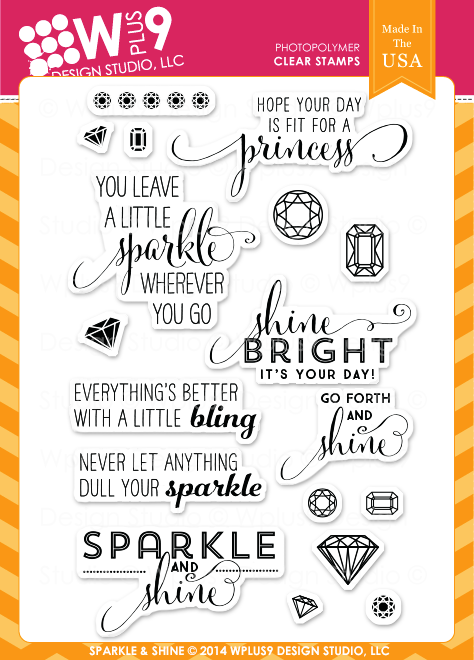 I just love the fonts in this as much as I love the sentiments themselves. This is my favorite card of the release. 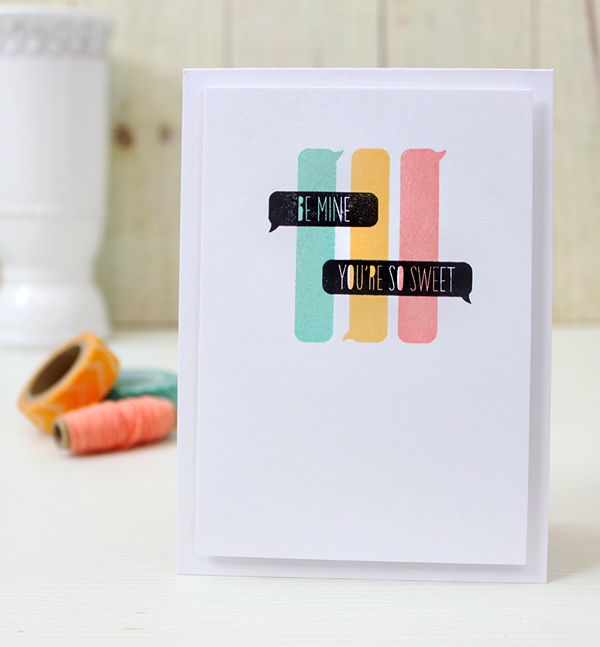 This could be a "love" card, but I think that sentiment just screams gratitude. Like you are so grateful, that your heart could burst! Know what I mean? I started with a watercolor panel and added a little watercolored "splash" in the center using Tim Holtz Distress Ink in Picked Raspberry and Spiced Maramalade. Once that dried a used the tiny little heart included in Unconditionally and stamped a few in Memories Black ink. 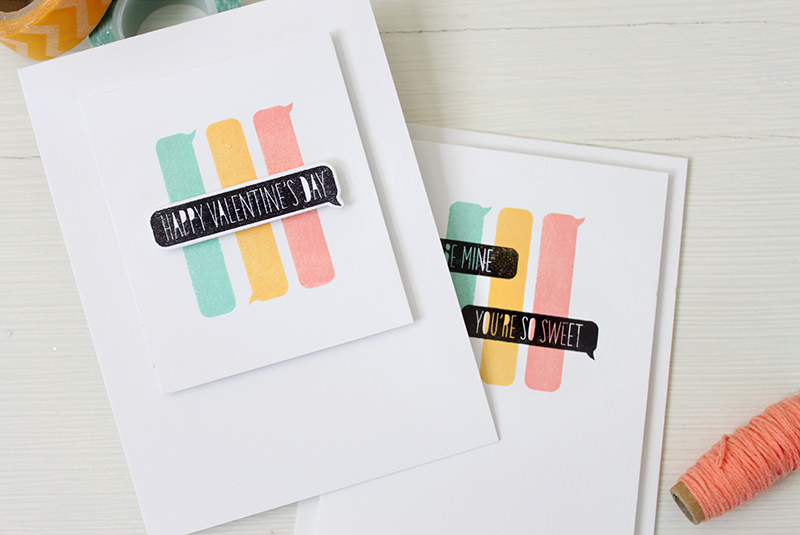 I stamped the sentiment using the same ink onto watercolor paper as well and adhered it with foam tape. To finish off the focal panel, I added a few arrows using the previously released Cupid's Arrow Die and a wood veneer heart. I wasn't digging the natural wood look for this card, so I just colored it with a black Copic Marker and then covered it with a little Glossy Accents. 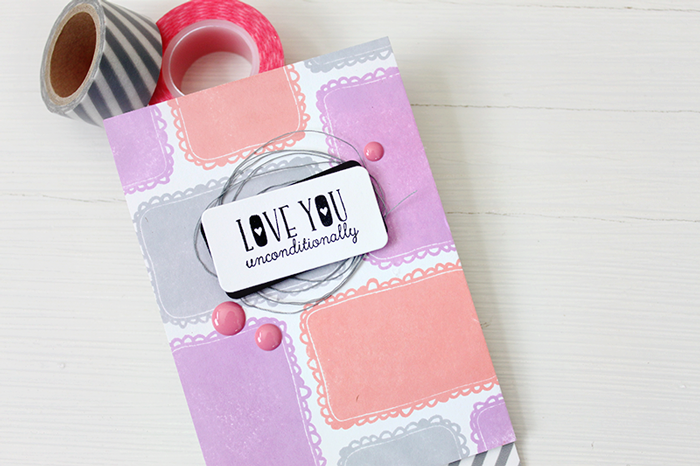 For the rest of the card, I layered a few neutral patterned papers together with the focal panel and added a mini clothes pin to "hold" them together. (Yeah, they are adhered together with adhesive too) I colored the top of the clothespin with a black Copic marker as well so it would match. Finally, I adhered the grouping to a Dove Grey card base using foam tape. Along with the sentiments, there is also a great little solid frame image included in this set. All of the sentiments will fit inside of it either horizontally or vertically, but I wanted to show you how you can use it beyond that. I really like the pattern this created by stamping the frame repeatedly to cover my background. I alternated between stamping it vertically and horizontally using Silver Lining, Bloomsberry, and Sweet Nectar ink on White cardstock. 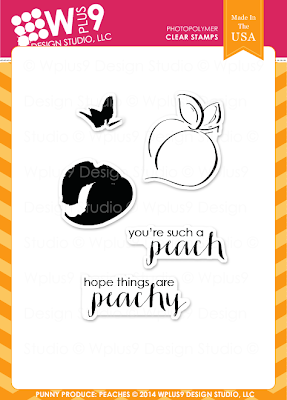 To add my sentiment, I die cut a rectangle using the smallest rectangle from the previously released Clear Cut Stackers: Rounded Rectangles Die and stamped the sentiment in Memories Black Ink. I cut another rectangle from Black cardstock and layered it behind the white one, offsetting it just a bit. I added a little bit of gray denim weight thread underneath for a little interest. I cut the top panel a little short and added some gray striped washi tape to the bottom of my white card base before adhering with foam tape. My last card for today is very graphic and something I've been meaning to try for some time now. And, since this is mainly a sentiment set, I thought it was the perfect opportunity to try it. I'm very happy with how it turned out! 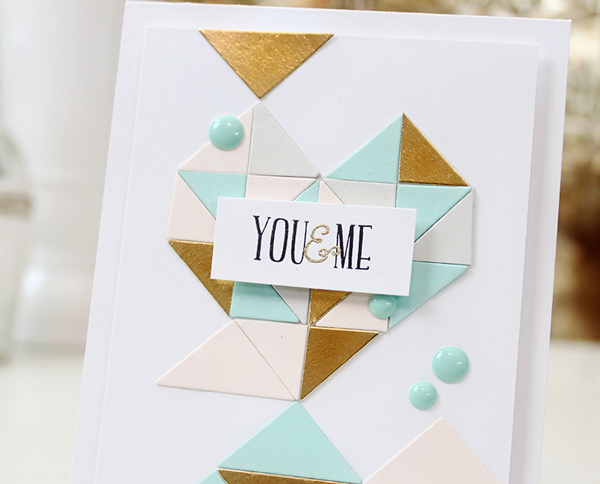 I started by die cutting the triangles using the Quilt Cuts 2 Die from Dove Grey, Cashmere, gold foil and aqua cardstock. 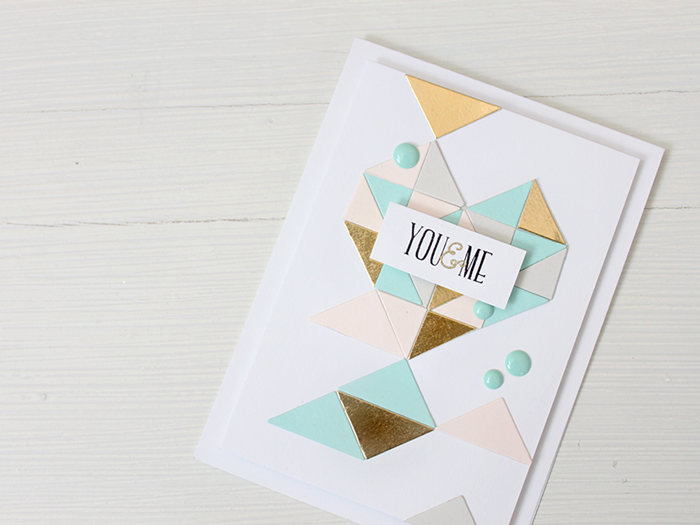 This die cuts the larger triangles you see surrounding the heart. So I just cut a handful in half directly down the center to get the smaller triangles and then arranged them in a heart pattern. I filled in the background with a few extra random larger triangles to help ground the heart and keep it from looking like it was floating. For the sentiment, I stamped the "you me" sentiment in black, stamped the separate ampersand and heat embossed it in gold and adhered it with foam tape to the center of the heart. Very easy design, and I think the font looks as great with the modern edgy look as it does with the more eclectic and collage style of the first card. What do you think? It's time for another giveaway! 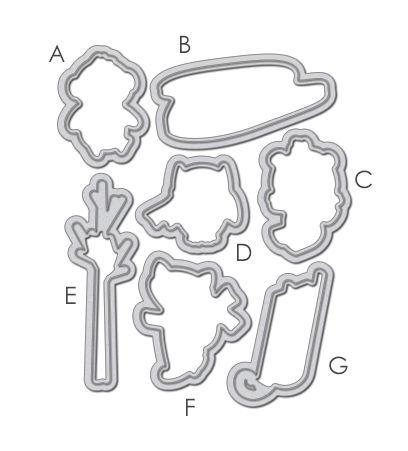 Would you like to win the Unconditionally Stamp Set, the Clear Cut Stackers: Rounded Rectangles Die and the Quilt Cuts 2 Die ? Just leave a comment below by 10:00 a.m. EST on 12/04/14 to enter. I will select one random winner from all comments. Winner will be posted on our Releaser Winners page by noon. Good Luck! We are half way through Release Week, so be sure to come by again tomorrow for more release inspiration and a chand to win it all!